Nursing Offers A Healthy Employment Future More nursing jobs will be created in the next decade than in any other single profession. The Bureau of Labor Statistics projects that nearly 600,000 new jobs for registered nurses will be created by 2018. The median wage for a registered nurse is more than $62,000 — almost twice the average for all occupations. 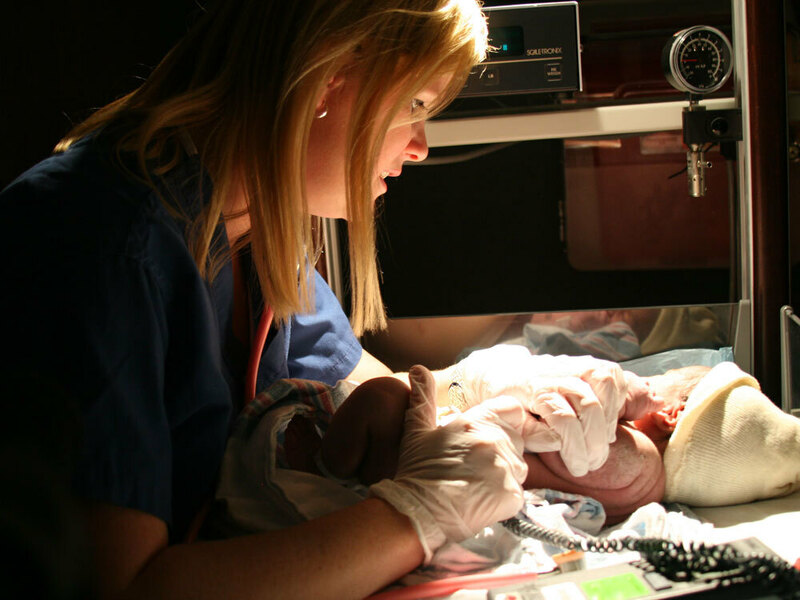 Tracy Wergley Graebener, a labor and delivery nurse, checks vital signs on a newborn at Virginia's Reston Hospital Center. More than 3 million jobs in the health care industry will be created this decade, ranging from highly paid neurosurgeons to home health aids making barely above minimum wage. And more nursing jobs will be created in the next decade than in any other single profession. The Bureau of Labor Statistics projects that nearly 600,000 new jobs for registered nurses will be created by 2018. Mike Jones hopes to get one of those jobs. Not long ago, he was working long hours in his father's construction business, and he wasn't happy. After a couple of hours on the phone with his brother, Jones made an unlikely career choice: He decided to become a nurse. "I enjoy helping people," says Jones as he sits in a common area at the medical education campus of Northern Virginia Community College. "[I've] never been in the medical field before. This is my first time. It's all new to me." Jones is 40 years old, never went to college, and before he worked construction was a United Airlines baggage handler. He sees nursing as his ticket to a solid income — and a solid career. "I feel secure. There's job security. So I'm not worried, like with the airline," Jones says. "I was concerned towards the end there and that's one of the reasons I quit. I just knew it was going downhill. ... I don't feel that with this." If you're picking a new profession purely based on the numbers, nursing is a pretty sure bet. "It's a large occupation," says Roger Moncarz, who does employment projections for the Bureau of Labor Statistics. "It's a growing occupation, and certainly there will be jobs there in the field over the next decade." You can get an entry-level registered nurse job with just three years of college. And Moncarz says the median wage for a registered nurse is $62,450, putting it among the highest wage-earning professions. "The fact that the wages are pretty high also sort of separates it from many occupations that would be growing," Moncarz says. "The median wage for all occupations was about $32,000, so the $62,400 is a decent wage." The perks don't stop there. "You can work any hours you want ... particularly if you're a bedside nurse," says Cindy Glover, the chief nursing officer at Northern Virginia's Reston Hospital Center, part of the large HCA hospital chain. Full-time nurses at the hospital work three 12-hour shifts a week. "And that's not bad, having four days a week off," Glover says. "Now, it's a hard day but, you know, that's not bad." But it's not all roses. There are night shifts and holidays, and then there are the patients. "It is a difficult job," Glover says. "It's very, very hard. I mean, people can be difficult healthy. You get them sick? And you know ..."
At 2:00 on a recent afternoon, ER nurse Christi Romney has a new patient with chest and abdominal pain and a serious case of alcohol withdrawal. He's vomiting into a plastic bin when she walks into his room. 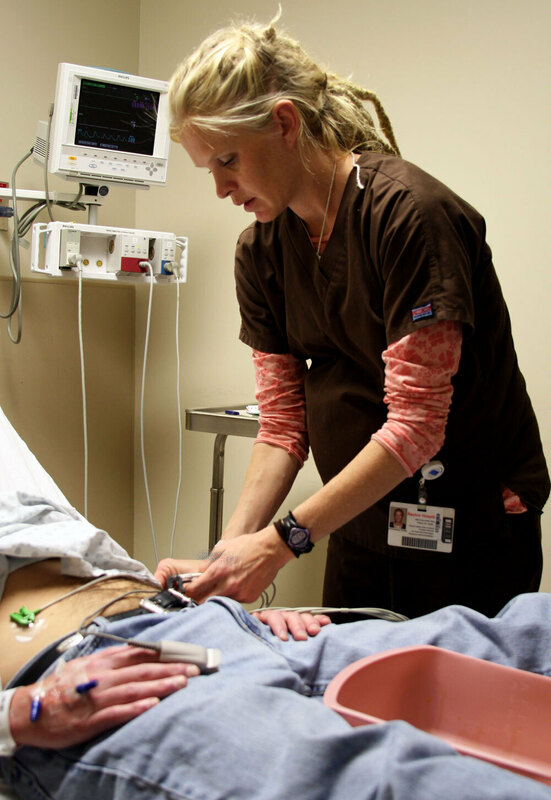 Emergency room nurse Christi Romney tends to a patient who came to the Reston Hospital Center experiencing alcohol withdrawal. "Don't apologize," Romney says. "I know you'd rather not be doing this." The patient is in his late 30s and tells her he'd been drinking all night. It's clear this isn't his first time coming to the ER after drinking too much. He asks for pain medication with a sense of urgency. "You really see everything," Romney says quietly while standing in the hallway outside his room. "We get drug seekers. We get, like this gentleman, alcoholics — a lot of those. If you can't be compassionate to people of all walks of life, then don't go into nursing." Romney has a master's degree in public health and in her first career did international aid work. But she says this hands-on work is incredibly rewarding, even if it means cleaning up after a drunken patient in the middle of the day. Nursing isn't the kind of job you do for the money. It's physically and emotionally taxing. "Not one thing is glamorous about my job," says Tracy Wergley Graebener, a labor and delivery nurse at the Reston hospital. "But nobody goes into nursing thinking it's going to be glamorous. It's gory and some people would call it gross, but it just is what it is." Graebener says she tolerates the unpleasantries because of the rewards. She's checking the vital signs on a baby girl born just minutes before. The baby is healthy and Graebener is glowing. This is her first nursing job. Just two years ago she was working as a pharmaceutical sales rep, making four times the money. But Graebener doesn't miss it all — not with moments like this.